The Gospel Music Association (GMA) has announced the 43rd Annual GMA Dove Awards nominees at a press conference held at The Georgian Terrace Hotel in Atlanta, GA, which was streamed live at HearItFirst . Nominees were announced by Grammy® nominated R&B artist Montell Jordan , known for his iconic hit "This is How We Do It," BET "Lift Every Voice" host CoCo Brother, Daytime EMMY nominated comedian Chonda Pierce , and World Heavyweight Champion wrestler AJ Styles. Bluegrass interest nominations below. Atlanta will host the Dove Awards for a second time at the Fox Theatre on April 19, 2012, following a sold-out show in 2011 hosted by Sherri Shepherd which aired on the Gospel Music Channel and garnered 1.5 million viewers. The Dove Awards have featured performances and appearances by some of the biggest names in entertainment and sports, including Whitney Houston, Tim Tebow, Sherri Shepherd and Kathie Lee Gifford. It has showcased many of the nation's leading Christian music artists, including Amy Grant, TobyMac, Michael W. Smith, Kirk Franklin, Casting Crowns, Mary Mary, Third Day and more. "The GMA is excited to again honor the artists, songwriters and creative individuals in our community through the 43rd Annual GMA Dove Awards," said Jackie Patillo, GMA's Executive Director. "This event not only celebrates great work, but provides a platform to further our mission of exposing, promoting and celebrating the Gospel through music." Christmas in Diverse City; TobyMac; Toby McKeehan, Christopher Stevens, Mike Woods, David Garcia, Victor Oquendo, SUPERHEROSE, Tre Corley, Arch Nemeciz, Tim Rosenau, Matthew Edwards, DOA Allen for the DESIGNATED HITTERS, Todde (toddiefunk) Lawton, Byron Mr. Talkbox" Chambers; EMI CMG"
The complete list of all nominees in all the categories is available on the Dove Awards web site. Founded in 1964, the Gospel Music Association serves as the face and voice for the Gospel/Christian music community and is dedicated to exposing, promoting and celebrating the Gospel through music of all styles including Pop, Rock, Praise & Worship, Urban Gospel, R&B, Hip Hop, Southern Gospel, Bluegrass, Country and more. The GMA community membership consists of agents, artists, church leaders, managers, promoters, radio personnel, record company executives, retailers, songwriters and other industry visionaries. 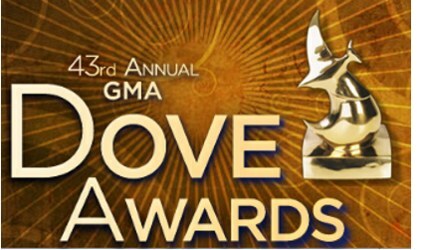 The GMA produces the GMA Dove Awards and IMMERSE. For more on supporting the GMA or becoming a member, please visit www.gospelmusic.org or contact the GMA directly at 615.277.1376. www.facebook.com/gospelmusicassociation.